Between 2013-2015, 84% of First Nations students aged 12 to 17 years living on reserve or in northern First Nations communities had not dropped out of school. 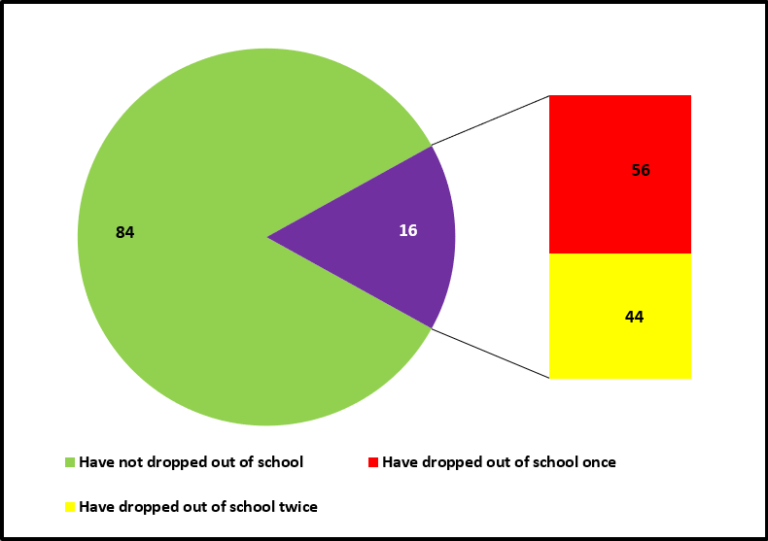 Of those who had dropped out of school, 56% had dropped out once and 44% had dropped out more than once. The primary reasons for dropping out were: being bored or not interested (33%); problems with their peers or the school climate, such as bullying (23%); problems with teachers (22%); being kicked out (19%); or problems at home (12%). First Nations youth have higher school drop-out rates than the general population. They face numerous barriers to school completion – many related to the social and economic contexts of their lives. However, their pathway to school completion is not necessarily straight, as many First Nations youth return to school after dropping out to attempt completion.